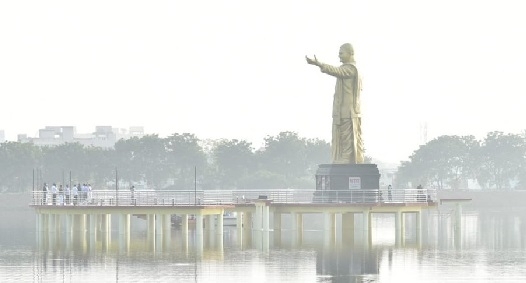 Guntur, Jan 18: On the 23rd death anniversary of Telugu Desam founder and former Andhra Pradesh Chief Minister N T Rama Rao, Chief Minister Nara Chandra Babu Naidu today unveiled the 36 feet tall statue of the legendary actor. The gigantic structure was erected at Sattenapalle in Guntur district. A brainchild of Andhra Pradesh Assembly speaker Kodela Sivaprasada Rao, the 36 feet structure of the former Chief Minister is tallest in the two Telugu states. A separate visitor gallery has been constructed to witness the grand statue from a vantage point. Naidu along with AP speaker Kodela Sivaprasada Rao took a boat ride and inaugurated the much-awaited NTR memorial. On this occasion, Guntur MP Rayapati Sambasiva Rao, Minister Prathipati Pulla Rao, and other TDP officials were present. On the other hand, the state government is also working on yet another NTR Memorial which is to be built in the capital region. On the lines of statue of Unity memorial in Gujarat, the state government has decided to elect the statue of TDP founder on Neerukonda hill. The monument will be come up in 14 acres of land. The proposed sculpture will be made of bronze. A dedicated trust will be constituted in order to raise funds for the prestigious project. The 32-meter-tall statue will be built with a whopping budget of 406 crores. In a bid to boost the tourism sector, the state government will develop infrastructure for star hotels, food courts, museum and other. A 500-seater auditorium has been planned to showcase the achievements of actor turned Politician.